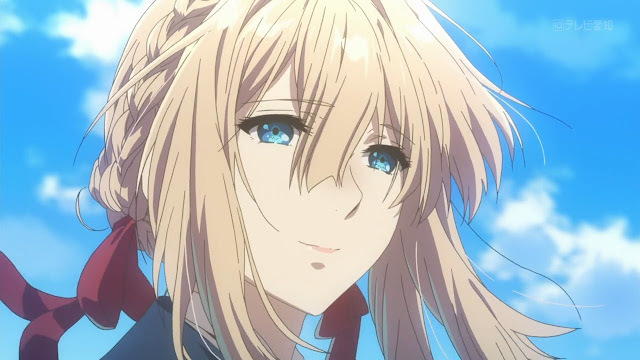 The anime follows Violet Evergarden, a woman who has trouble experiencing emotion and has been expressionless for so long, she was treated as a tool rather than as a human. Upon surviving the war, she enlisted herself to become a doll, or someone who would write a letter to another person in order to convey the sender’s feelings to them, in order to understand the meaning of the words uttered by the person dearest to her. And what do i think about this anime? 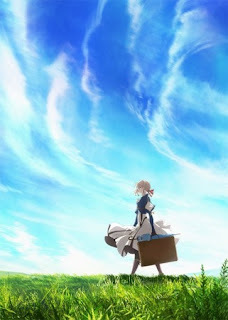 If my memory serves me correctly, Violet Evergarden was the first and only light novel, at the time of this writing, to win the Kyoto Animation grand prize for light novel at 2014 or so and was promised to have an adaptation in the future. Believe it or not, I have known about this project for about 3 years and was surprised to finally learn that it will finally be airing at January 2018 and for an avid KyoAni fan, this is a magnificent news, although I was a bit skeptical at that project, and hoping that this would be an awesome project. But, by golly, I was captivated by what I have seen for the past 3 months. 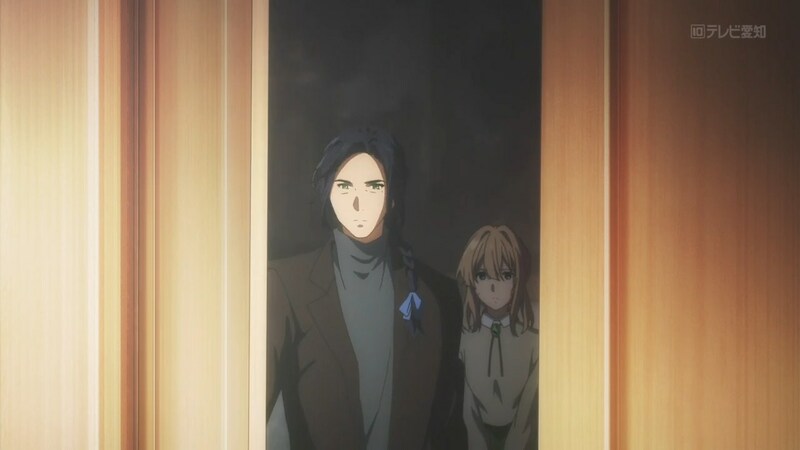 First of all, allow me to clarify that I have written a blog post regarding Violet Evergarden in the past, regarding it’s grand ambition and how huge of a project it was, such as how it visually captivating, how stellar the voice cast both in Japanese dub and the English dub, something that was rare, and how it was acquired by Netflix. A long-time project has finally arrived. And I am pretty sure Netflix have glad that they took the series for their Netflix Original series, as the premiere of the show captured the audience of so many. The first episode of it was so memorable that so many people have already highly-regarded this to be a very successful anime and a stellar project to undertake. I’d lie if I say that I was not captivated by the first episode though, as it was so magnificently done, I couldn’t wait for the next episode to air. And everything was good up until I realized something, that this is adapted from a 3-volume light novel. At that time, I pondered on how will the series fare? For the first time in ages, I was glad that KyoAni took that 12-episode route as it allowed Violet Evergarden to not overstay it’s welcome and become so formulaic that it will plague the anime in the future. Why do I say that? Because everything began to unravel in episode 4 or so. The anime-original content was necessary in order to fill in the gap for several episodes, such as inclusion of new characters, anime-original episode, and many more. While Violet’s adventure as an Auto-Memory Doll is an exhilarating tale, it was the anime-original characters that felt weak, and we shall get to that a little bit later. For now, I would like to talk about several problems that the anime faced during it’s airtime. 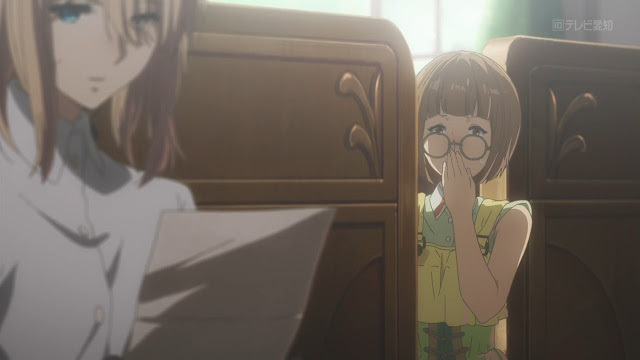 Of course, the most baffling one that Violet Evergarden started to plague the series is it’s musical score. 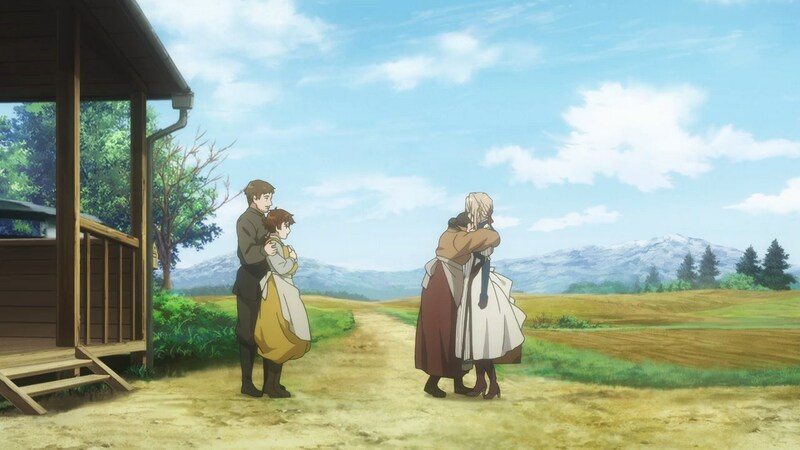 Do not get me wrong since the musical score of Violet Evergarden was so marvelous and fantastic and felt like it comes out from a blockbuster movie or a high-budget anime, and I liked it a lot to be honest. However, the problem was the timing of the music. There are numerous moments where the anime tries to fill in grand musical score in a scene so unfitting that it kills of the impact of that scene prematurely, and I didn’t say that lightly. Picture the scene, Violet handed in a letter to her friend’s big brother which contains her friend’s pure emotion that she wanted to convey to her brother for so long, and the time is night with no insects or any other environmental stuffs to bother. Of course, since the letter was moving, the older brother started to cry since he felt his sister’s pure emotion flowing for him. And all that was good, until you realize that the music playing in the background was an upbeat music coupled with several trumpets and such. I can't help but wonder how many times the music ruined several scenes. 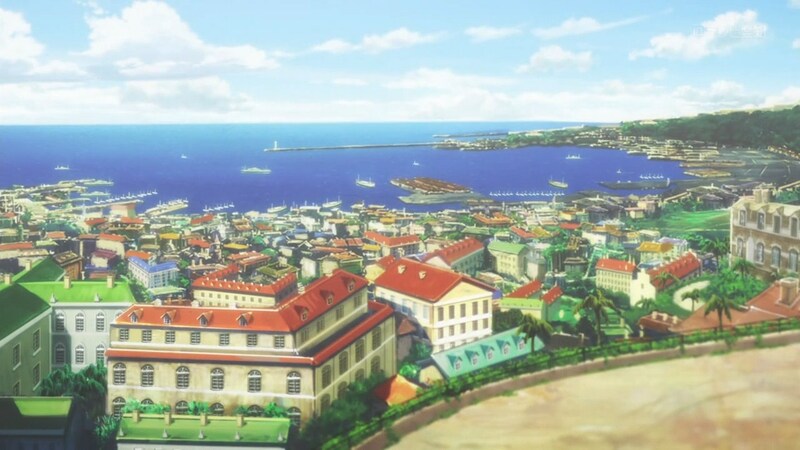 Another problem that I found during the course of watching Violet Evergarden is it’s formulaic theme that goes for several episode, which I found too repetitive and predictable until the story finally moves on with an actual plot. The theme is simple, Violet gets called in for a service of a doll, then she meets someone, writes something for that someone, and that something she wrote, and that person is suddenly either reformed or was glad that Violet is there. While the execution was planned perfectly, you can’t help but notice the repetitive aspect of the formula, which becomes too annoying to ignore. Also, speaking of repetitive, I really, really, disliked Violet’s behavior of removing her gloves to reveal her clockwork arm, surprising those in vicinity. 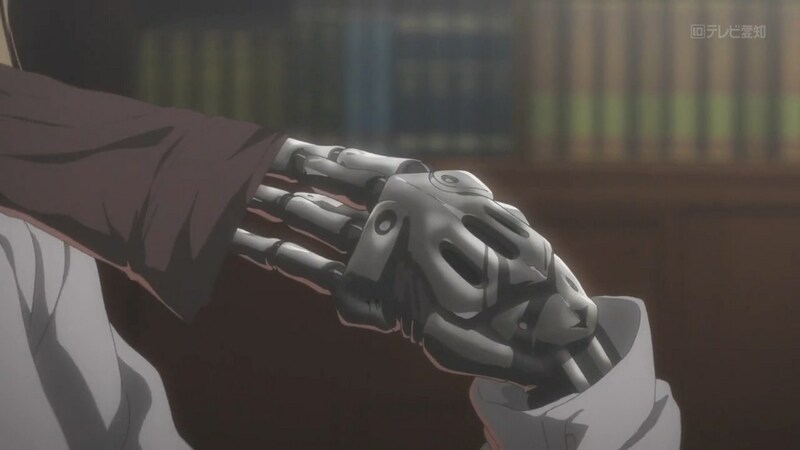 While it was done perfectly during the first few episodes, you can’t help but notice that KyoAni kept doing this over and over again, making Violet’s clockwork arm a little bit less impactful everytime she removed the gloves since she just kept doing that same thing again and again. Remember, something is bound to be special and memorable if done rarely, and will become an afterthought when it is done too much. This is one of those few times that it actually happened though. The formulaic theme of Violet Evergarden made several episodes felt predictable at times. And this behavior of Violet as well. The last problem that I found was the characters, in the form of Erica Brown and Iris Cannary. Their characterization was a bit shallow and they mostly would just fade out to the obscurity the moment the show finally gets the grinder going. They did got their own episode that focused on them and their relationship with Violet, but that’s just it. We just learn that Erica wants to be a famous doll while Iris just wants to overcome her lack of confidence, but that’s it. They played no further memorable part in the future plot other than the one time they written a letter to Violet. In any case, they should have been given more plot points and importance, but the anime fails to capitalize on this aspect. The same could not be said, however, to several one-off characters that Violet helped though. Some of them are not really that memorable, but I would say the other half of them were very memorable, especially the novelist, the sick mother, and the soldier. A little bit of spoiler alert but most of their request deal with either filial bonds or their loved ones, and even in a rare instance, I shed a tear during the penultimate moment after the soldier’s letter has finally been sent to his family and loved one. It was so emotional and phenomenally done that it makes the execution of it so touching. 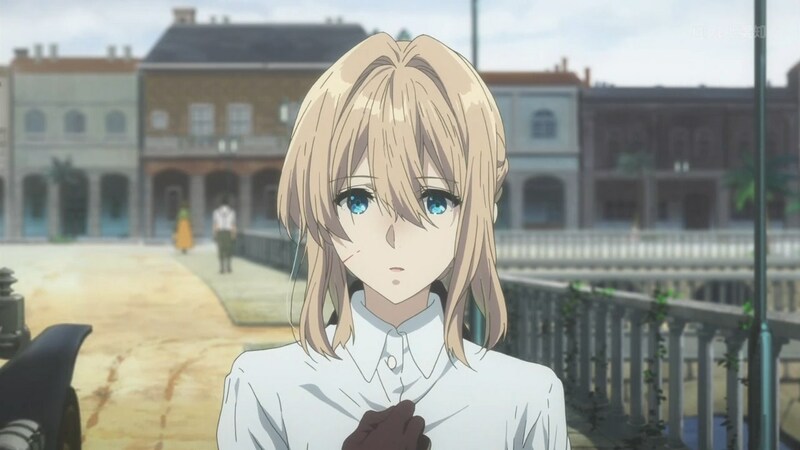 Violet Evergarden sure deliver some of the best emotional moments for anime. Part of those is also thanks to Violet connecting with the audience. 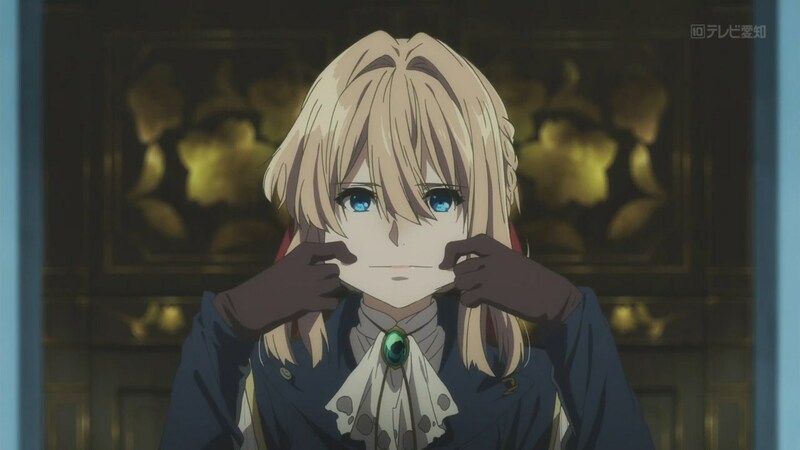 Violet Evergarden, the titular character of the anime, spends the most amount of time in our screen, since she is the main character. This anime delves on one single matter, on how Violet wanted to learn emotion, wanted to truly understand the meaning of the word that her major gave her, and wanted to understand herself better. She was shown to be robotic at first, unable to understand the basics of emotion, and blindly follows order, even if it puts her at a bad state, and some even causes trouble for her comrades or her clients, but that is because she was learning about emotions and trying so hard to understand them. 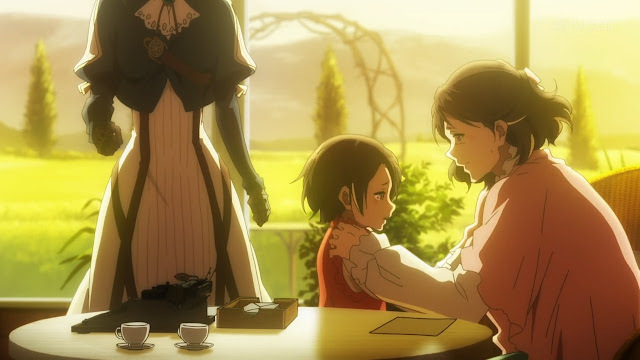 Over time as the anime progressed, even the simplest of the matter, even during Erica’s character focus episode, we get to learn Violet and how she interacts with people, such as how she tries so hard to emulate the mimic of those, trying to force a smile on her face when it was initially impossible for her to do so, and how she was very tactless at times. That allowed her to connect with the audience, who wants her to understand herself better, to understand the emotion better. This is the most important aspect though, as a main character should garner the audience’s interest and sympathy, and Violet has, in my opinion, garnered some of that, which helped her progression as a character to be even more meaningful. And by the time she has learned how to smile, how to properly express her desire, and how to communicate with other people, we as the audience felt genuine happiness when she does. When she finally conveyed her genuine smile to her friend, I can tell you I really felt that moment, and it was very special. And saw how she grows and learns all the emotion and expression by herself. 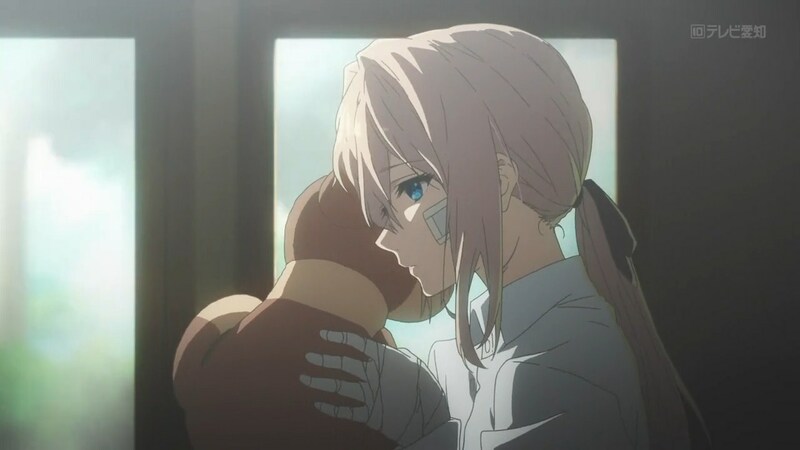 However, despite the merits that Violet give as a character, she is basically the only character that we can connect and care about. Other characters in the show felt like a second fiddle to her. Take for example Cattleya. By the end of the show, the only thing I can say about her is that she is a top-notch doll who acts as a mentor to Violet but that’s it. And of course, with the aforementioned Iris and Erica, they were pretty bad. Although I do have to give my praise to both the Bougenvillea siblings. Gillbert, Violet’s commander, was very supportive in Violet’s growth as a human and wants her to properly learn how to express her emotion and communicate with people better, and his flashback episode that depicted his final battle with Violet was pretty solid, which gives a little bit of an insight to Violet’s past, and some connection with Gillbert. 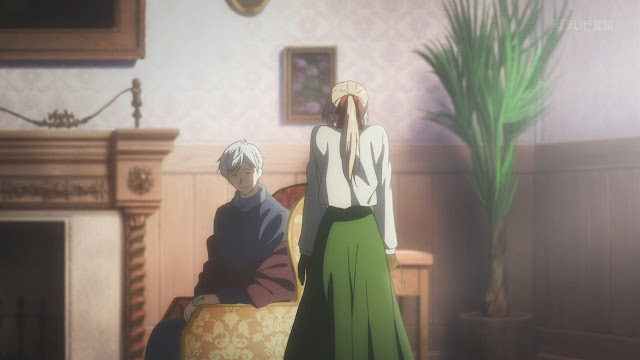 On the other hand, Dietfried, Gillbert’s brother, is very interesting despite the fact that he appears slightly bit later, and makes several cameos in a handful of episodes, as his story was relayed when he is finally focused, that he is torn with his loss and continually blames himself and Violet for what he has lost. And when he has finally learned the reason why Gillbert was so affectionate towards Violet, he finally understood everything and he finally accepts Violet as a human. All in all, both Bougenvillea siblings are better written than most characters in the show, and i really liked Dietfried a lot, and he stands as my second favourite character in the show, just below Violet. I really enjoyed Dietfried's appearance in the show, albeit it's a bit limited. Another reason i liked Dietfried is his voice, particularly in his English voice, since he is voiced by Keith Silverstein and his cynical tone constantly reminded me that of Masayoshi Shido from Persona 5 although Keith was very great in his role as Dietfried with his tone somehow connected with Dietfried’s character pretty well. Speaking of voice actors, both the Japanese and English voice was very stellar in the term of star power and this is very rare for KyoAni, considering the fact that they liked using younger and newer voice actors while backing their performance with the voice of veteran voice actors. And especially in the English dub, they used quite a stacked voice actors, in the form of Erika Harlacher, Cherami Leigh, and Christine Marie Cabanos, who previously worked for Persona 5. And even the minor roles are filled in with several notable voices, such as the aforementioned Keith Silverstein, Cassandra Lee Morris, Karen Strassman, and even Johnny Yong Bosch. In terms of performance, Yui Ishikawa was very convincing and powerful in her role as Violet. She managed to deliver several tone which resonated with Violet’s character so well and her calm demeanor fits the role very well. Aside from her, everyone sounded okay. The English voice also sounded good, compared to other anime titles who used a fairly limited voice actors. In short, the voice-acting territory of Violet Evergarden was done good. Yui Ishikawa's performance as Violet is truly stunning and accurate. As for the visual, Violet Evergarden is practically KyoAni’s finest work in the terms of visual. Everything looks so beautiful and vividly animated. Colorful and panoramic background, wonderfully animated characters, and just about everything. Nothing seemed or looks out of place, even during the simplest moment of a scene. KyoAni is normally great in delivering good visual, but this is just turned up to eleven. Although I do have to say that KyoAni once again utilized the same character model that looks just like how a KyoAni works looks. The finest visual that Kyoto Animation ever delivered. And last but not least, there are several plot points that the anime failed to explore thoroughly. One of such instance is the meeting between Dietfried and Violet. We are given a simple enough information on how Violet was picked up by Dietfried from the front or something like that, but there is nothing to explain the end of episode 5, where Dietfried looks very annoyed that Violet has become a doll that helps so many people despite her past where Dietfried mentioned how she took the lives of his comrades. I was really anxious on how it will be played out, but it was not explored at all nonetheless. While everything did worked out pretty well, I was hoping that something came out of that. 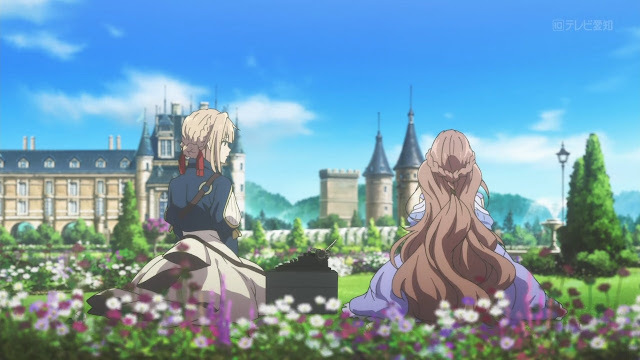 All in all, Violet Evergarden is a phenomenal anime series which is hampered only by few issues, but those issues did not stop this anime series to be so highly regarded right now. The plot seems simple, but the execution was marvelously done, even when it falls to a formulaic themes at times. The musical score is awesome, but sometimes sounded out of place, and the visuals are very tantalizing to behold. If you are a casual anime watcher, then you can give this anime a shot, since the plot is fairly easy to digest, but not that easy to swallow, so as to allow those who enjoy anime even more to look at it deeper. Those who are not fan of this genre should try to give this anime a shot as well, since this anime may sound simple, but simple thing is sometimes the best. The ambitions to become an international are a bit visible at times, given it's simplistic theme of a young woman searching for the meaning of love, the lack of japanese characters in each name, and the Netflix... I'm sure you can read about it more in my short article regarding Violet Evergarden. Oh yeah. I do notice that some people rants during the course of Violet Evergarden on how several anime-original content differs greatly from the light novel and how it hampers the anime down, especially Erica and Iris. I would say that they aren’t very knowledgeable when making those rants, as KyoAni is well-known for their tendency of tampering with the source material, and once again, Violet Evergarden is limited to just 3 volumes, causing the adaptation to 13 episodes a bit hard to do. And thus, the filler-like episode was created to fill in the gap. You wouldn’t want to see Violet Evergarden plot to be so rushed that they end in episode 6-7 right? Sometimes, filler are necessary to build up the characters and the plot so that the end result are worth the filler. The anime can be a hit or miss to some, but it is a certain hit for me. The good : Violet is very memorable as a character. Visually awesome. Musical scores sounded grand and elegant. Stellar voice-acting, both in English and Japanese dub. The bad : Aside from Violet, most of the cast seemed shallow. The music sometimes does not fit the scene. Several plot points are not explored thoroughly. Highlight : The soldier’s and the sick mom’s letter. Also, when Dietfried finally is focused. Final Score : 4 out of 5. If only those technical issues are resolved and some cast are given more reason to connect with the audience, then this could be one of the best anime to ever come out. Note to Blog : I am currently at the point where i am writing thesis for my Bachelor's degree. As such, the activity on this blog will be greatly reduced though i will try my best in updating once in a while. Anyway, as a side note, my thesis will be about a specific anime, so i think i will have fun writing it. The soundtrack's pretty amazing. :) I feel Violet falls kind of flat to me as a character, and she seems a lot like a broken doll. I feel that something is missing within her and I can't quite place what it is. It's an entirely unique anime, though.